When Google announced Rich Snippets for reviews six years ago, it provided publishers with an entirely new way to promote their content by incorporating structured markup into their webpages. Since then, structured data has only become more important to Google Search and we’ve been building out the Knowledge Graph to better understand the world, the web, and users’ queries. 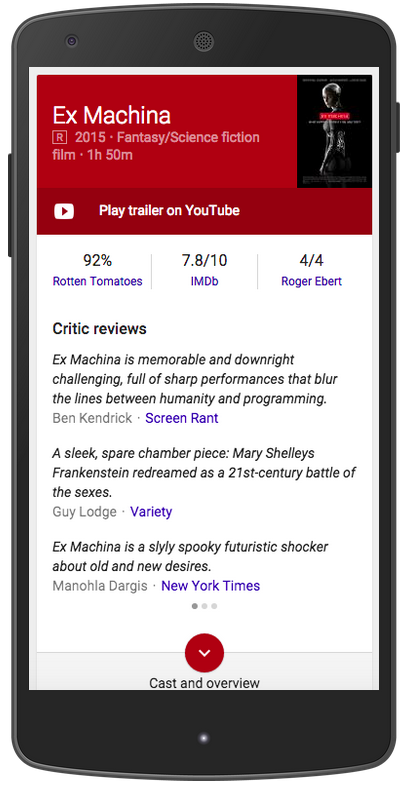 When a user asks “did ex machina get good reviews?”, Google is now aware of the semantics - recognizing that the user wants critic reviews for the 2015 film Ex Machina and, equally importantly, where to find them. With the recent launch of critic reviews in the Knowledge Graph, we’ve leveraged this technology to once again provide publishers with an opportunity to increase the discoverability and consumption of their reviews using markup. This feature, available across mobile, tablet, and desktop, organizes publishers’ reviews into a prominent card at the top of the page. By using markup to identify their reviews and how they relate to Knowledge Graph entities, publishers can increase the visibility of their reviews and expose their reviews to a new audience whenever a Knowledge Graph card for a reviewed entity is surfaced. Critic reviews are currently launched for movie entities, but we’re expanding the feature to other verticals like TV shows and books this year! Publishers with long-form reviews for these verticals can get up and running by selecting snippets from their reviews and then adding schema.org markup to their webpages. This process, detailed in our critic reviews markup instructions, allows publishers to communicate to Google which snippet they prefer, what URL is associated with the review, and other metadata about the reviewed item that allows us to ensure that we’re showing the right review for the right entity. Google can understand a variety of markup formats, including the JSON+LD data format, which makes it easier than ever to incorporate structured data about reviews into your webpage! Get started here.